Heat oven to 400°F. Unroll pie crusts on work surface. Using 2 1/4-inch round cookie cutter, cut 12 rounds from each crust. Gently press 1 round in bottom and up sides of each of 24 ungreased miniature muffin cups. 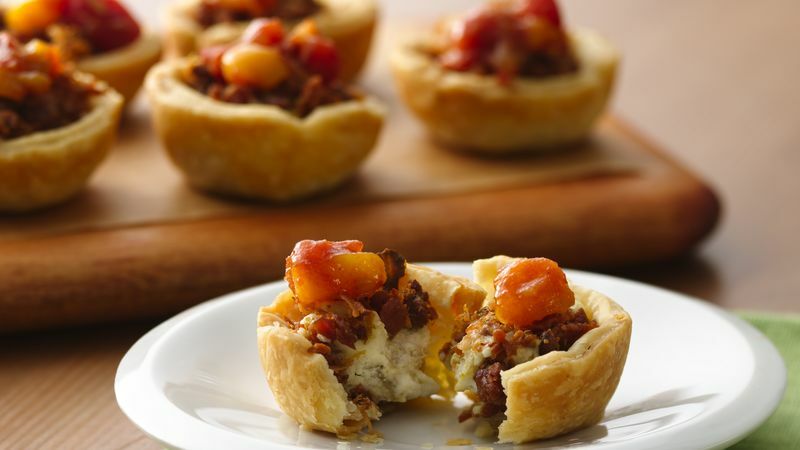 Spoon about 1/2 teaspoon bacon into each pie crust-lined cup. In small bowl, mix cream cheese and chiles until blended. Spoon 1 teaspoon cheese mixture into each cup. Spoon remaining bacon evenly on top of cheese mixture in each cup. Bake 13 to 16 minutes or until edges are golden brown. Cool 10 minutes. Remove from pan. Top each with 1/2 teaspoon salsa. Serve warm or cool.